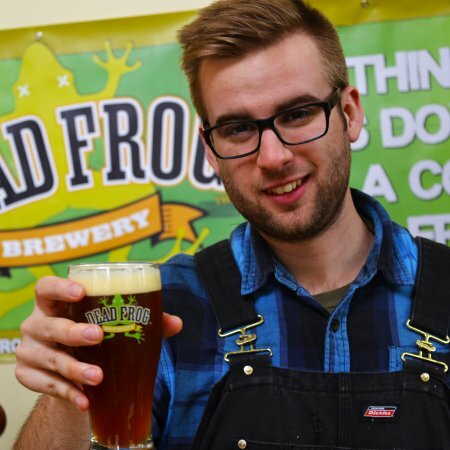 ALDERGROVE, BC – Dead Frog Brewery has announced that head brewer Tony Dewald is leaving to join a new craft brewery opening later this year in Abbotsford, and his assistant brewer Nick Fengler (pictured above) will be moving up to the head position. While continuing to brew Dead Frog’s established flagship brands and seasonals, Fengler will also be adding his own touch to the brewery’s offerings, with an ESB, a buckwheat ale, and a golden session ale all planned to be released in coming months. Nick is an avid homebrewer. He has a BSc in Biology with a concentration on the biology of organisms, along with a minor in Chemistry. He has worked under Tony Dewald for the past two years, so knows our core lineup very well. Nick was actively involved in the development of the Super Fearless IIPA and The Obsidian Dagger IPA Noire, our two highest rated beers on Untapped.